In Finland, a young law firm is applying strategic design principles to make the law more accessible and their legal products more user-friendly. When the paradigm shift happens, this legal design approach might be required to comply, their CEO predicts. 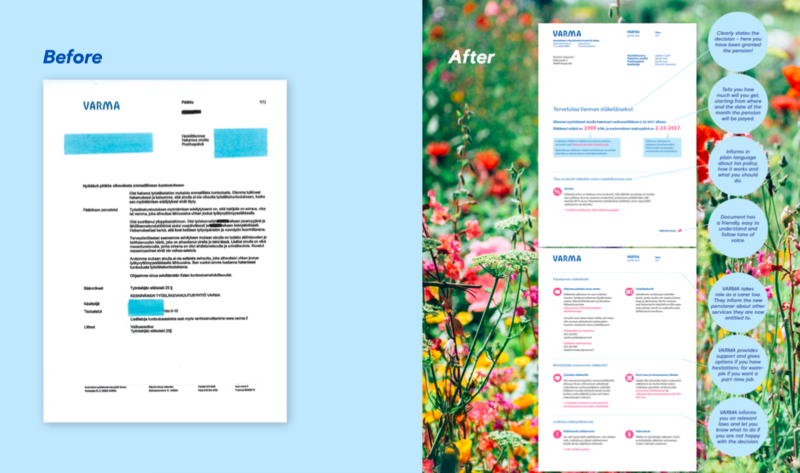 “It is really important to understand that applying design principles to legal work does not mean that you are drawing flowers on a due diligence report or adding a couple of icons to a contract. It is a powerful strategic design process which is about much more than making the law more visual or paying a designer 5 euros to change the font in a contract. It is about focusing on the users and getting to know your end-user before you do anything. That is something both lawyers and legal tech solutions should learn. Lawyers are not know-it-alls anymore.” says Antti Innanen who is CEO in the modern, young and agile Finish law firm Dottir. Dottir has offices in Helsinki, Berlin, and San Fransisco and brands itself as a lean law firm which implies that they have adopted the agile culture from today's software development companies. Since 2017, they have also been running the legal design consultancy Dot. in Helsinki and Paris that combines legal design thinking with legal expertise and new technologies. “I initially thought that I came up with it but then I did a Google search and found out that others were doing similar projects. When we started in 2015, we found out that there was a small hub in Finland doing contract visualization and legal design lab in San Fransisco, so we contacted them and said we wanted to join the movement. We have been practicing legal design ever since,” Innanen says to Legal Tech Weekly. Dottir and Dot. are self-proclaimed user-centric and aims to design legal products that are both useful and engaging. Instead of acting like all-knowing experts, they try to understand the specific needs of the user before they deliver the legal service: “It is about listening to the clients and then develop a solution. That kind of process has not been used in law before since it is usually very top-down. But strategic design is well-tested. We import those methods and tweak them to the legal world which I find really inspiring,” says Innanen. “We do client workshops and we might have validation workshops to get the understanding of what we should actually do. It is more collaborative, and a little more diverse since there is always at least one designer and one lawyer present in these teams. It might be a little bit more resource intensive and it might take a little more time so it depends on the situation. If you need something quickly and efficiently then it might not be the right solution but if you have multiple stakeholders and the subject is difficult, then I think the legal design process is really really powerful,” Innanen elaborates. Could give me an example to make the idea of legal design a bit more tangible? “A good example could be the FAI, The Finish Arbitration Institute. They wanted a holistic view of arbitration processes so clients and lawyers could understand them. We started the project by interviewing core-users, having workshops with end-users and validating workshops with their people also. Then during the process, we did a great visualization of the current arbitration process but we also listened to the clients and found out that they wanted something more than a static visualization. 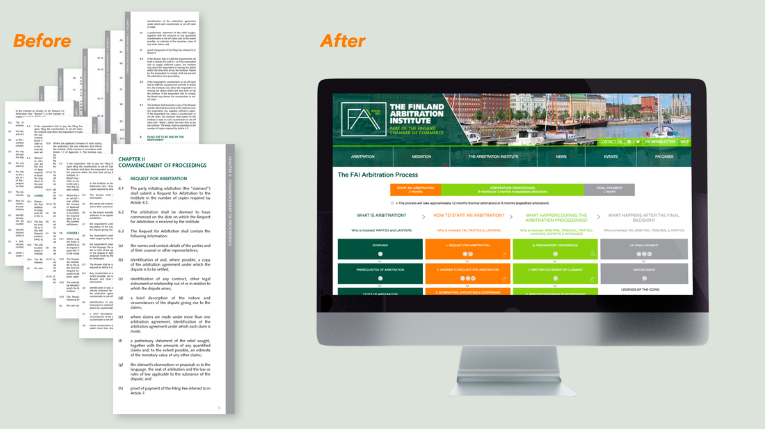 They wanted something clickable, more digital, more interactive. So by actually listening to the end-customers, we built the digital tool which is now live on the website. The power of this process is that you don't just develop something blindly which is happening a lot in legal tech. We have done it also; you know, developed some technology without knowing how to connect with the client and the user even though it was solving the right problem. It is really important to figure out the user needs before doing tech for tech's sake,” Innanen answers. 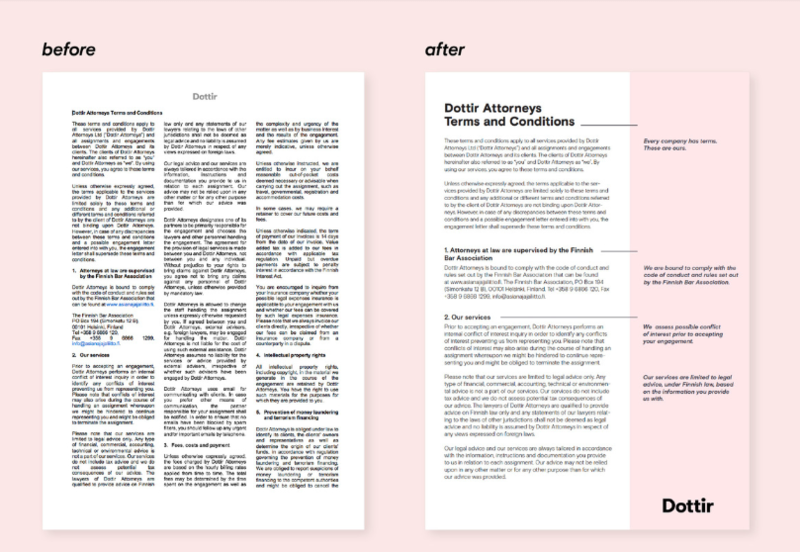 How has legal design influenced the work you do in Dottir? "Currently, we are doing a lot of client-facing projects but little by little, the mindset is shifting in our own law firm. We are setting the bar higher and adding a lot of high-quality client work so we are looking critically at our own documents also. Our own Terms and Conditions looked horrible a couple of years ago. Now we have one that speaks with the brand and is much more simple." There is a lot of talk about being user-centric, client-centric or customer-centric and this idea of making the law more accessible but simultaneously you also hear law firms say that the demand is not there yet. Is that something you have experienced? Terms and conditions or contracts are often complex as they have to communicate exceptions, special circumstances etc. How do you make sure that the users are sufficiently informed about their legal situation without making a long, tedious text? "I think that it is a matter of building an UI on top of the existing documents that will then guide the user through different possible scenarios. What people are asking from us a lot is an overview of the situation with layered information - like a zoomable map of different situations that also gives you the overall picture." So do you think every law firm should apply legal design and hire designers? "I think it might be a designer but it might be something else also. I think the future will be very multidisciplinary. In regular law firms, 5 years from now, there will be economists, designers, data analyst, AI-people. Law is going to open up and be more multidisciplinary. In that sense it is going to be more diverse and those law firms that can create a diverse culture that engages business people and designers will thrive. There will always be specialized law firms or law firms that deliver services from a legal perspective but I do not think clients will be willing to pay for risk management anymore. They want their documents to be engaging, sell better and in the form of digital tools."